We are all familiar with the concept of food rationing in the Second World War, but it also happened during the First World War. Food rationing was introduced in 1918 and a committee was formed to consider how best to use ‘natural resources’. One way was to use children from rural and countryside schools to go out into the countryside and pick blackberries during school hours. These would be sent to the ‘Government jam-making scheme’ and pots of blackberry and apple jam were made to send to the serving soldiers. Other reports say that the juice was sent to them as it was high in vitamins and fibre. Blackberry vinegar, too, may have been made for those serving both at home and on the various fronts. Blackberry vinegar is known for being taken medicinally in hot water when a head-cold strikes. The Women’s Institute was formed in 1915 and they produced and preserved food during the First World War. Their ‘rallying cry’ was: “'Though the boys and men are gone, the furrows shan’t be fallow, while the women carry on’ – a sign that women were stepping into the shoes of the men who had gone to serve their country. The WI continued their work and made blackberry and apple jam for the troops in the Second World War. In Kent on the 7th September 1918, the Kent Messenger reported that school children had been given three half-days each week to go out and pick blackberries for the National Blackberry Collection. Local food control committees were appointed to take in all the blackberries that the children collected. These were not small amounts and some schools collected as much at 2,000 lbs of fruit over the weeks they were gathering them; that’s just under one metric tonne. At Willingdon Village School in East Sussex the log book recorded 17 days when the children were blackberry picking. On the first afternoon (9th September 1918) they collected 73 lbs for jam making. 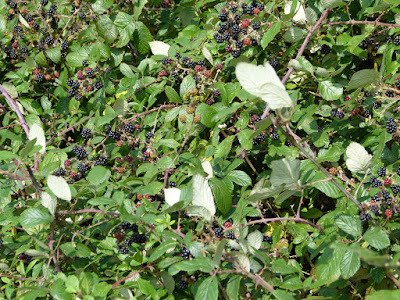 The 123 children were paid for their efforts and to read how much and more about the blackberry picking at Willingdon Village School, please click here. However, a great number of school log books record children going blackberry picking much earlier than 1918. In Barnstaple boys from the Holy Trinity School were collecting blackberries in September 1914 to ‘make jam to send to the “Jam Committee” of their local distress fund'. To find out more about blackberries, just click here.